31 days. 31 days of blogging. Another year of Slice of Life completed. I’m pretty sure that this is my tenth consecutive year of participating in the March Slice of Life challenge and the fifth or sixth year that I’ve had my classes participate. I love the challenge and I especially love blogging with my students. They always begin the challenge morning and groaning about how hard it will be. Slowly, over the course of the first 3ish weeks, they begin to like blogging everyday. By the end of the challenge many of them become blogging afficionados. Today I read many final slices. 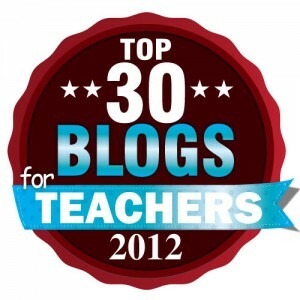 Almost all of my students mentioned how much they grew to enjoy and appreciate the blogging challenge. They especially love learning more about their classmates (and I love learning about all of them). They also mention becoming more observant of the little things in their lives. Thank you to Stacey and everyone at Two Writing Teachers for hosting this challenge every year and inspiring me! 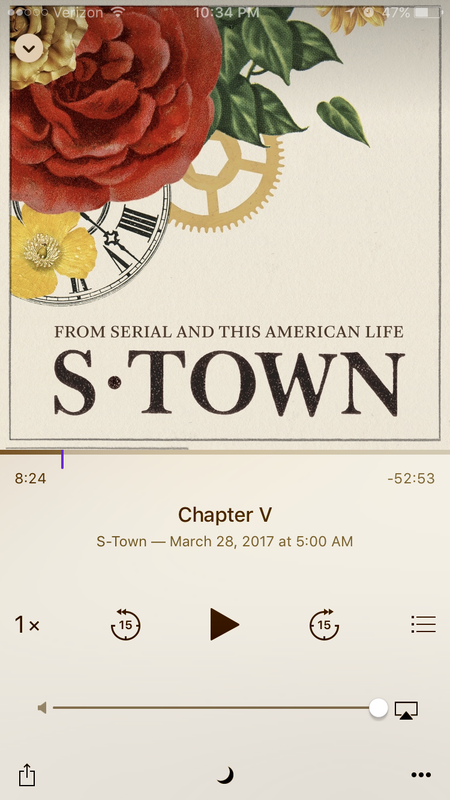 One of the differences between Serial and S-town is that the episodes were all released at the same time instead of one per week. Despite this change, I planned to listen to the episodes slowly. Yeah, that did not work out. I’m on episode five of seven and I had to stop myself from powering through the last few episodes tonight. It’s absolutely fantastic and riveting. I won’t say much more because I don’t want to spoil it. All I’ll say is that I highly recommend it, especially if you enjoy character studies and mysteries. The e.e. cummings quote above is one of my favorites and it was very appropriate today. The dogs and I went for a walk after school because the weather was gorgeous. What I did not realize was just how wet the trails would be. 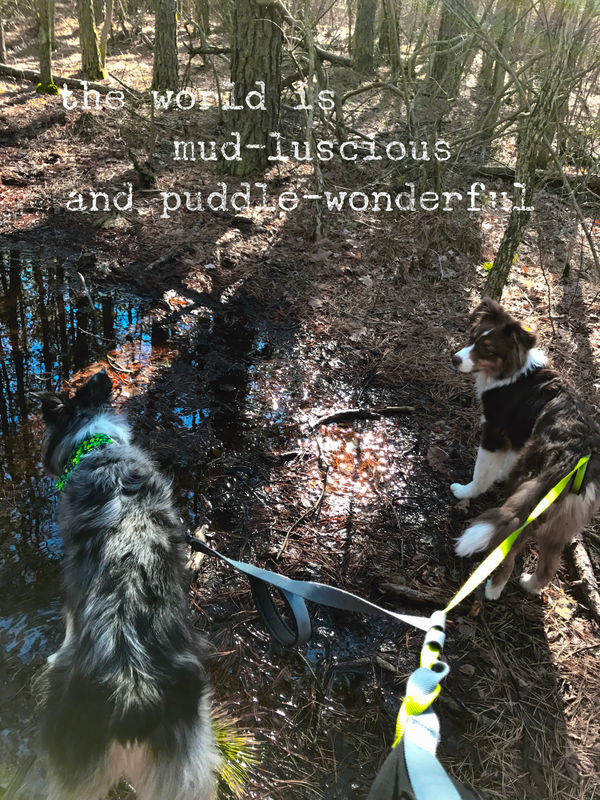 Once we got into the woods the puddles were frequent and huge. Navan is not a fan of puddles but even he could not avoid all of them. One thing he was not worried about avoiding was the horse manure all over the trail. I hate it when horses go to the bathroom on the trail because the dogs alwats want to eat it. Aussies can have a genetic abnormality that makes Ivermectin, a horse wormer, fatal. Of course, Navan managed to grab some manure despite my efforts. He then proceeded to come home and throw up manure on my couch. Why not? In 2004, Chris and I adopted a cat from the Edison shelter, a kill shelter near Rutgers, and brought him home. He lived in Chris’ college house, in what was essentially a large closet, until Chris graduated and got his first apartment. He was a loudmouth and loved meowing at the other cats who lived in the house. He also loved to jump from the bed to the dresser when he wasn’t curling up under the covers. But his favorite thing in the world was sitting at the window and chattering at the squirrels outside. In 2005 Chris moved into an apartment and Guinness discovered that the world was larger than one room. He loved his catnip and could chase a laser pointer all day. Stairs were a new concept but the sliding glass door to the balcony was the best new aspect of life. He would stare out the door and windows for hours. In 2007 we bought the condo and suddenly Guinness had two floors to explore! The world outside the sliding glass doors was exciting and full of life. Chattering at the birds and squirrels would sometimes take up his whole day. When we came home from work we would find Guinness sleeping on our bed or the guest bed. Sometimes he was curled up in the office chair. If he could jump onto it he would sleep on it. In 2009 we brought home Dublin. We weren’t sure how Guinness would react but he put Dublin in his place right away. They played together and argued over toys and Guinness always won. He loved sitting on the half wall and dangling his tail just slightly out of reach of Dublin. He’d race up and down the stairs, enticing Dublin to chase him and then he’d jump out of reach. In 2011 we did it again and brought home Bailey. She thought she was going to be the boss, and she was. Well, she was the boss of Dublin. Guinness put her in her place with a few well-placed swipes of his paw. Those kitty claws didn’t mess around! Bailey loved to chase Guinness and he loved to be chased. Guinness moved again in 2014. He was not thrilled but he adjusted better than I expected. He never really got used to the new layout…..a ranch was not his first choice. But he did love the windows and he especially loved the bird feeders. Most of my bird feeders are right outside the window where he liked to sleep and he’d watch them for hours. This past summer I added a bird feeder to the kitchen window and he would stalk the birds who were brave enough to swoop in and steal a few seeds. He also snuck out of the house a few times after we moved but he always ran to the porch within a few minutes of getting outside. He was an indoor cat, through and through. When we lost Bailey Guinness took it harder than I expected. But over the past few weeks he was doing great. He was playing with Navan a bit and eating like a horse. He was definitely a senior kitty but after losing some weight after Bailey’s death he was gaining some back and playing on his cat tree again. Today Guinness suffered what was most likely a stroke or an aneurysm. I came home from school to find him in bad shape, even though he was perfectly fine when I left in the morning. My amazing vet saw him immediately but there was nothing any of us could do. I spent a few minutes with him saying goodbye and then it was over. We’ve said goodbye to two pets in the past few months. Bailey suffered from lymphoma so we had time to say goodbye. It was impossibly hard and I never wanted to go through that again. 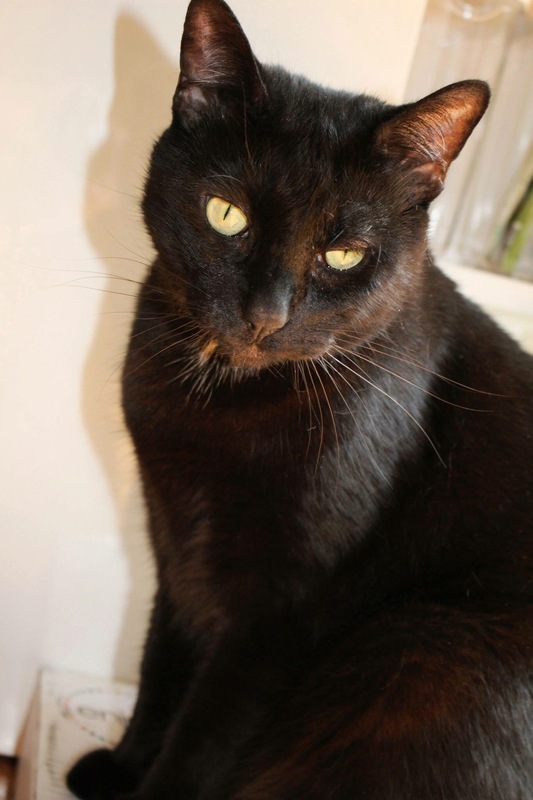 Guinness’s death was very sudden but that did not make it any easier. I’m going to miss him begging for food while we eat dinner and walking on the back of the couch while we watch TV. That is the smile of a very happy Aussie. Tonight Chris took Navan to puppy class so Dublin and I hung out. We played frisbee in the backyard for a bit and I grabbed them “soccer” ball. 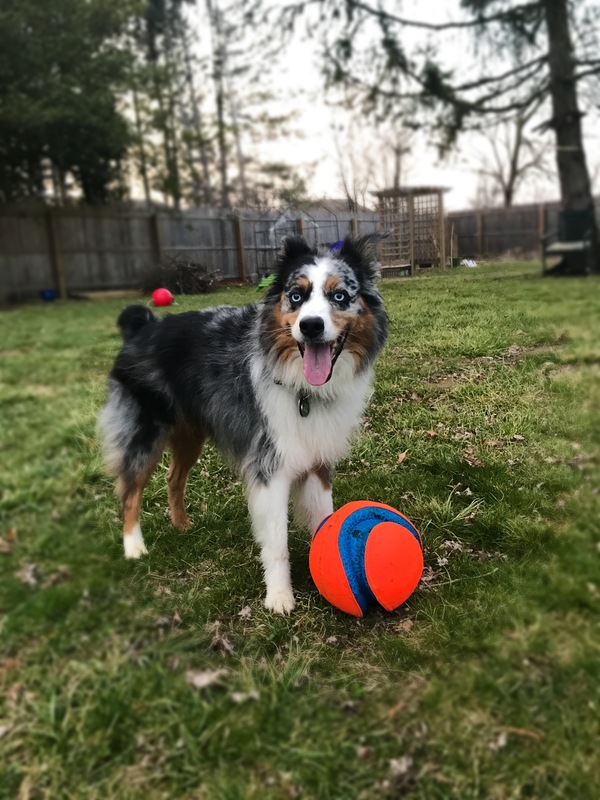 Dublin used to love playing “soccer” but it’s been ages since he’s done it. That’s likely due to the fact that a puppy is always around to take the ball away. Bailey never met Dublin play with her toys and the Chuck-it ball in the picture was hers. It was nice to see Dublin playing and having fun tonight. I still stop and look for Bailey all the time so seeing her favorite toys back in the mix was bittersweet but it also made me smile. She loved her ball and while she didn’t love sharing I think she would want them to be played with. Dublin and I spent about a half hour playing outside in the yard. He was tired and happy when we finished. Navan and Chris got home just a few minutes later and now both dogs are cuddling on the couch. Weekends go by way too fast. I think it’s because I always try to do too much and before I know it the two days have flown by. Sunday’s are always busy because I work in the morning. From 9-11am I teach an SAT prep class. Today I ran an information session about the summer class from 11am-12pm so I did not get home until about 12:30pm. Chris had a race in Philly this morning (where he came in 1st place!) but he beat me home. So when I walked in he made a quick sandwich and then we headed out to walk to dogs. We had a great walk at the park down the street and did 2 miles in about 45 minutes. It was way colder than yesterday, though! By 2:45pm we were home and I quickly headed out to do food shopping for the week. That took another hour. When I got home I took care of the cat while he played with Chris (he’s been having a tough time since Bailey died). I caught the end of the first basketball game while cleaning and then watched the second game whole cooking dinner and getting some recipes ready for the week ahead. What an incredible game! And I’m currently in first place in one of my pools! Now it’s 10:45pm. Chris and I watched a few episodes of Parks and Rec and an episode of The OA. Now I’m catching up on The Zoo on Animal Planet and getting ready for bed. Somehow there are still two weeks left before spring break! Rodger Sherman on Twitter: "why does the Florida Gator do the gator chomp with his arms if he has a gator mouth capable of chomping"
Alexandra Chipkin on Twitter: "#NYCTAF "Being a Writer" Panel — To outline or not to outline, that is the question. https://t.co/jCGhVfa3t5"
Terry McGlynn on Twitter: "As my kid gets older, the number of friends who ask me to find space for their own high schoolers in my research program is growing. Ugh." Donald J. Trump on Twitter: "“You can’t con people, at least not for long. If you don’t deliver the goods, people will eventually catch on.” – The Art of The Deal"
Connie Konya on Twitter: "@Strawberryread @DeathMetalLib @LindaMarchisio @maryray27 @TriciaColonnese @MediaChickatRpp @maddielumama #spsmedspec https://t.co/bewVpdo3Jp"
Heather & Jessica on Twitter: "I've been harassing @mauxbot for an ARC of I BELIEVE IN A THING CALLED LOVE for so long and it's finally here! YAY. I can't wait – J https://t.co/XAYn9XUQPn"
gae polisner on Twitter: "I said to my sister, "what am I laughing at here?" And she said "at your unabashed love for @AdamSilvera?" Probably. #nyctaf https://t.co/uV9vtkmAwA"
Laurie Ann Thompson on Twitter: "I LOVE nonfiction poetry! It can simplify concepts and add meaning at the same time. Great for cross-subject connections and classroom use. https://t.co/xrFoY1VavT"
Stacy Dillon on Twitter: "What happens when a librarian marries a skater? Out of the box projects. Details to come soon!" Michelle Papa on Twitter: "A5: Workshop on literacy across content areas. It's all of our responsibility. Admin, too! #nErDCampNJ"
Sarah Mulhern Gross on Twitter: "Adding “And Then The Murders Began” As The Second Sentence Of Any Book Makes It Instantly Better https://t.co/LAELB4E2O9"
Sarah Mulhern Gross on Twitter: "It’s 60 days until #nErDCampNJ! Have you registered yet? What are you waiting for? https://t.co/2xEIBDdiQU #njed #engchat #nerdybookclub https://t.co/UtUx8N3M5p"
Mindful on Twitter: "Spending time in nature makes us happier, boosts our immune system, and increases our attention span. https://t.co/pNcggRDGR8 https://t.co/GDfKuhyEGy"
Michelle Obama on Twitter: "Look who has a spring in their step! Celebrate the #FirstDayOfSpring by grabbing a friend, heading outside, and getting moving. https://t.co/yQTb0sQgCc"
Sarah Mulhern Gross on Twitter: "Ss requested another copy of @acthomasbooks's bk after rding today's NYTimes article: https://t.co/YJuns1bgeT"
Sarah Mulhern Gross on Twitter: "It’s 65 days until #nErDCampNJ! Have you registered yet? What are you waiting for? https://t.co/2xEIBDuTIs #njed #engchat #nerdybookclub https://t.co/1yOHDWPFj3"
Kevin English on Twitter: "Reframing Independent Reading: We Can Start By Not Grading It (Three Teachers Talk) https://t.co/q7xhiZQMHh https://t.co/LkOSpAWhTR"